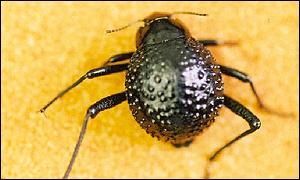 Back in 2001 the first reports came out on an african desert beetle that gathered water in its wings from the air. The beetle thrives in one of the driest places on Earth. Last year some MIT scientists copied the structure of a beetle’s wings to make surfaces with hydrophilic/superhydrophobic patterning. This year some Aussie’s developed a water from air collector. Once you look through the article article below, check out the follow up article–as well as the work of the MIT scientists mentioned above. There might be a way to significantly enhance the Australians work. 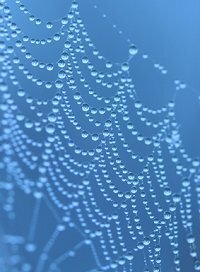 Leaves and spiders’ webs beaded with dew have inspired a low-tech solution for collecting fresh water. 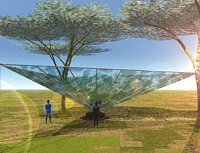 WatAir, an inverted pyramid made from elastic canvas, recycled polycarbonate, metal or glass, can reap dozens of litres of water a day from the air. The inexpensive solution could help bring clean drinking water to people in remote or polluted areas, its developers say. “The design has minimal special demands. It is low-tech and low-cost, and in fact can be even produced with local means,” says Joseph Cory, a PhD candidate at the Technion-Israel Institute of Technology and an architect at Haifa’s Geotectura Studio. Cory and colleague Eyal Malka of Malka Architects recently won first place for the invention in a competition sponsored by WaterAid, an international nonprofit organisation dedicated to providing safe domestic water to poor nations, and Arup, a UK-based firm specialising in sustainable designs. Cory and Malka were inspired by the passive way dew gathers on leaves, spiders’ webs, even on sleeping bags and tents. They designed a four-sided structure shaped like an inverted pyramid, with each panel about 3 metres tall. At night, dew drops bead up on both the tops and undersides of the panels. Because the dew collecting on top may contain dust, dirt or insects, that water could be used for irrigation. But dew from the underside is drinkable. Gravity draws the drops downward into tanks, wells or bottles at the bottom. A 96 square metre structure can extract a minimum of 48 litres of fresh water daily. But the dimensions can vary, says Cory, from a small personal unit that fills a water glass to several large-scale units that provide water for a community. The low-tech approach requires only low-cost materials and is quick and easy to deploy, says Cory. WatAir can be built locally but is durable enough to be dropped by parachute from a plane. The cost could be offset by printing sponsor logos or advertisements onto the canvas sheets. “It is simple, practical, adaptable, sustainable, flexible and draws inspiration from nature resulting in a minimal intervention with potentially a big impact,” says Frank Lawson, a senior engineer at Arup. Cory and Malka are also looking into modifications to WatAir that could help produce energy. They are investigating embedding photovoltaic cells into the canvas to convert sunlight into electricity. The energy could be used to power electrical appliances or charge batteries. Or it could be used to cool the surface of the dew panels, which would allow the structure to produce water all day long. Now consider the article below: Scientists at Ohio State have developed a kind of nano fiber that can attract or repel water. This fiber might be further enhance the device above. I’m sure the drawback here is that these fibers are much more expensive than the Aussie materials. Tiny plastic fibers could be the key to some diverse technologies in the future — including self-cleaning surfaces, transparent electronics, and biomedical tools that manipulate strands of DNA. The patent-pending technology involves a method for growing a bed of fibers of a specific length, and using chemical treatments to tailor the fibers’ properties, explained Arthur J. Epstein, Distinguished University Professor of chemistry and physics and director of the university’s Institute for Magnetic and Electronic Polymers. Finally, they also showed that the fibers could be used to control the flow of water in microfluidic devices — a specialty of study co-author L. James Lee, professor of chemical and biomolecular engineering and head of Ohio State’s Center for Affordable Nanoengineering of Polymeric Biomedical Devices. The National Research Council’s (NRC) Water Science and Technology Board has undertaken a — Department of the Interior and U.S. Bureau of Reclamation — sponsored study on advancing desalination technology. They want to know how fast research is moving–ie how fast research will result in desal costs coming down. How much money to spend to make it happen. Where to allocate funds in the most promising research fields. How desalination compares to bulk water transfers. etc. Its been ongoing for about a year. It should be completed by year end. The last meeting is 08/08/2007. If you want to participate and you don’t have private access –they will have some meetings open to the public. I’m thinking of going myself. But it would be better to have people who were closer to the research — throw in their two cents. And of course, for those whose research is dependent on federal dollars — Woods Hole, Mass August 8 — would be a good place to be. Come to think of it… Woods Hole has been a famous destination in years past for science people. So be there or be square. Below is the only PR I’ve seen on this. Clarkson University Professor and Associate Dean of Engineering Amy K. Zander is the chair of the National Academy of Sciences Committee on Advancing Desalination Technology. The National Research Council’s (NRC) Water Science and Technology Board has undertaken a study on advancing desalination technology. Zander’s committee is conducting a study that will produce recommendations to federal, state, and local governmental and private entities concerned with advancing desalination. The committee will study the potential for both seawater and inland brackish water desalination to help meet anticipated water supply needs in the United States, assess the current state-of-the-science in desalination and recommend long-term goals for advancing desalination technology. Following up on an NRC recommendation calling for the development of a national research agenda, the committee will determine what research is needed to reach the long-term goals for advancing desalination and what technical barriers should be resolved with existing technologies. The committee will also examine the practical aspects of implementation, like economics, financing, regulatory, institutional, public acceptance, and consider how much research funding is needed to significantly advance the field of desalination technology and the appropriate roles for governmental and non-governmental entities, including the private sector. The study, sponsored by the Department of the Interior and U.S. Bureau of Reclamation, should be completed by the end of the year. Zander has been a faculty member in the Department of Civil and Environmental Engineering at Clarkson since 1991. She was promoted to associate professor in 1997 and was named full professor in 2003. She has been the associate dean for Academic Programs in the Wallace H. Coulter School of Engineering since 2005. Her research interests are in the areas of physical and chemical separations in environmental systems, especially drinking water and wastewater treatment technologies. Her work involves finding new solutions for safe drinking water and for minimal impact of water and wastewater treatment systems on the natural environment. She specializes in membrane processes — both pressure-driven and concentration-driven — in environmental processes. Zander has published dozens of journal articles, written and co-written numerous book chapters, and delivered papers at some 50 professional and academic conferences throughout North America. She has managed research projects totaling over $800, 000 from the National Science Foundation (NSF), the American Water Works Association Research Foundation, and other funding agencies. Zander has served on two prior committees of the National Academy of Sciences, producing the report Safe Water from Every Tap: Improving Water Service to Small Communities in 1997 and Confronting the Nation’s Water Problems: The Role of Research in 2004. Her other honors include the Association of Environmental Engineering and Science Professors (AEESP) Distinguished Service Award in 2005; the 2003 Samuel Arnold Greeley Award from the Environmental and Water Resources Institute, a division of the American Society of Civil Engineers (ASCE); the AEESP/McGraw Hill Award for Outstanding Teaching in Environmental Engineering and Science; and Clarkson’s 1999 Distinguished Teaching Award. The National Academy of Sciences (NAS) is an honorific society of distinguished scholars engaged in scientific and engineering research, dedicated to the furtherance of science and technology and to their use for the general welfare. The NAS was signed into being by President Abraham Lincoln in 1863, at the height of the Civil War. As mandated in its Act of Incorporation, the NAS has, since then, served to “investigate, examine, experiment, and report upon any subject of science or art” whenever called upon to do so by any department of the government. Clarkson University, located in Potsdam, New York, is a private, nationally ranked university with a reputation for developing innovative leaders in engineering, business, the sciences, health sciences and the humanities. At Clarkson, 3, 000 high-ability students excel in an environment where learning is not only positive, friendly and supportive but spans the boundaries of traditional disciplines and knowledge. Faculty achieves international recognition for their research and scholarship and connects students to their leadership potential in the marketplace through dynamic, real-world problem solving. Find out more about the study at http://www8.nationalacademies.org/cp/projectview.aspx?key=48674. Posted in: Water Desalination Research and Development | Comments Off on Advancing Desalination Technology. According to this article there are 20 desalination plants on the drawing boards in California. The costs described by the article look like 1990’s costs. These costs have been more than halved in the last decade or so. A recurring problem suggested by the article is intake structures. See the article below on how the Australians are dealing with intake structures. I really like the picture below. See how the Australians solve the problem of wee beasties harmed by salt concentrate. The bore arrives at the desalination plant this morning. The first of two German-built tunnel boring machines to be used at the Tugun Desalination Plant has arrived at Tugun to begin the tunnel “under the seabed”. The two laser-guided machines, which utilise GPS technology, will dig the inlet and outlet tunnels for the seawater to be used in Queensland’s first desalination plant. At Tugun, just to the north of Coolangatta Airport, two 70-metre vertical tunnels have been built to allow the project team to build two horizontal tunnels which extend about 1.5 kilometres out to sea. Infrastructure Minister Anna Bligh said the Tugun project was on track to provide 125 megalitres of desalinated water by the end of November 2008. “This project is critical to beating the drought and they (the workers) know it,” she said. The Queensland Water Commission project reports for April show the project will provide water at “33 per cent capacity” by November 2008, and “water at 100 per cent capacity” by January 15, 2009. Ms Bligh said the Tugun project had several advantages over desalination projects elsewhere in Australia. “A great benefit of the Tugun site is that unlike Sydney and other places, this is a marine tunnelling project, having minimal impact on the environment and local communities as the tunnels – which will be 70 metres underground – do not run under any privately-owned land,” she said. Eleven kilometres of pipeline to connect the desalination plant to the Western Corridor Recycled Wastewater Project have been delivered. Ms Bligh said the progress at Tugun did not mean the government was still looking at a concept for a desalination plant on Bribie Island. “The issues in relation to possible other locations for desalination plants are quite complex,” she said. “Every location has its own challenges. The issue with Bribie Island is that it is located close to a very shallow and important marine ecosystem – and that is Moreton Bay. “Here at Tugun we can take the water about 1.5 kilometres out to the deep ocean where the brine can be distributed without any damage to the marine environment. “Moreton Bay is a very sensitive fish and marine habitat. It is much more shallow and we are very, very hesitant about putting a desalination plant into that environment. A study group priced the drilling at 2 million. But the length of the intake tunnels is likely 200 yards rather than 2000 yards as is the case in Australia. If you read last weeks blog Saltwater into Fire any time between last Friday and Tuesday–you’ll want to check back. I have been pretty steadily updating it. Now it appears that unlike electrolysis –which is net negative for energy output–low energy RF is net positive for energy output. imho that’s cool. (uh, well, actually, world beating.) However, the secret sauce that makes this work imho is even cooler. I think you’ll find this to be interesting too. Check it out. A low-cost water desalination system developed by New Mexico State University engineers can convert saltwater to pure drinking water on a round-the-clock basis ­ and its energy needs are so low it can be powered by the waste heat of an air conditioning system. A prototype built on the NMSU campus in Las Cruces can produce enough pure water continuously to supply a four-person household, said Nirmala Khandan, an environmental engineering professor in NMSU’s Department of Civil Engineering. New Mexico and other parts of the world have extensive brackish groundwater resources that could be tapped and purified to augment limited freshwater supplies, but traditional desalination processes such as reverse osmosis and electrodialysis consume significant amounts of energy. This research project, funded by the NMSU-based New Mexico Water Resources Research Institute, explores the feasibility of using low-grade heat — such as solar energy or waste heat from a process such as refrigeration or air conditioning — to run a desalination process. Khandan said the project builds on a process, first developed by researchers in Florida, that makes distillation of saline water possible at relatively low temperatures — 113 to 122 degrees Fahrenheit rather than the 140 to 212 F required by most distillation processes. The system utilizes the natural effects of gravity and atmospheric pressure to create a vacuum in which water can evaporate and condense at near-ambient temperatures. Two 30-foot vertical tubes — one rising from a tank of saline water and the other from a tank of pure water — are connected by a horizontal tube. The barometric pressure of the tall water columns creates a vacuum in the headspace. Raising the temperature of the water in the headspace over the saline column slightly more than that of the freshwater column causes the flow to go in the other direction, so that pure, distilled water collects on one side and the brine concentrate is left behind in a separate container. A temperature increase of only 10 to 15 degrees is needed, Khandan said. Potentially a desalination system using this method could be coupled to a home’s refrigerated air conditioning system, Khandan said. The 30-foot-tall NMSU prototype is powered by a solar panel. Khandan and his research assistant, civil engineering doctoral student Veera Gnaneswar Gude, have modified the process originally developed by Florida researchers to incorporate a thermal energy storage device that allows the system to operate around-the-clock, using stored energy at night. The Institute of Energy and Environment housed in the NMSU College of Engineering helped them instrument the system. Their research on the system’s capabilities has been presented at national and international conferences and their research continues. The project is one of many research initiatives at NMSU aimed at addressing the critical needs of New Mexico and the nation. “Eye on Research” is provided by New Mexico State University. This week’s feature was written by Karl Hill of University Communications. You really have to see this to believe it. No that’s likely not good enough. You’ll have to get your own low energy radio wave machine and toast some salt water yourself. That’s what’s John Kanzius has done. The Sanibel Island Florida inventor was looking for a way to desalinate water but instead found a way to burn salt water. According to reports low energy radio waves split the H20 up into hydrogen & oxygen. It looks like The Na & Cl in solution acted as a heat sink or electrolyte . Or anyhow I assume so since the process wouldn’t work on fresh water. Maybe the RF acts as the catalyst as this discussion suggests. See below for the answer. One way or another -something bubbled out of solution. And with a flick of a bic the gases turned to fire. Anyhow here’s a couple videos. Understand. Electrolysis results in a net loss of energy. ie you put in more energy than you get out. Do not conflate electrolysis with radio waves. Radio waves represent a much smaller energy input. Small enough to make for a net gain in energy? Charles Rutkowski placed a test tube filled with ordinary salt water into John Kanzius’ external radio-wave generator. He then blasted the salt water with 200 watts’ worth of directed radio waves, not quite enough electricity to light three 75-watt light bulbs. Within seconds, a blue flame erupted from the top of the test tube. It then turned bright white like a blowtorch’s flame and burned for several minutes at about 3,000 degrees Fahrenheit. “I’ve done this countless times and it still amazes me,” said Rutkowski, general manager of Industrial Sales and Manufacturing, the Millcreek company that builds Kanzius’ generators. For starters, here’s a simple experiment that shows that salt increases many fold the output of hydrogen from electrolysis. (The Kansius experiment does not involve electrolysis but rather Radio Waves). Here is a second bit of fun with a microwave that shows that the microwave can turn a flame off and on at will and make the flame burn high & hot. You can see in Kansius’s salt water burning video how Kansius turns the high hot fire off and on at will. The suggestion here is that the radio waves are both splitting the water and then further exciting the flames. As well, I’m suggesting that the process is analogous to that in a microwave oven. Update:I talked on the phone to one of the scientists Ed Apsega at APV Engineering in Akron Oh. They tested John Kanzius process. I was told the flame burned at more than 1700 degrees Celcius or 3000 degrees Farenheit. (Its not clear to me currently as to whether the energy yield is more or less than 1:1. Why? Well the APV engineering scientist Ed Apsega said the energy yield was much more than 2:1 and later I talked to John Kanzius–he said the energy yield was less than 1:1.) The yellow flame was the glass burning. (The flame started out clear.) The temperature inches away from the flame was room temperature. Tests afterwards showed that the water was reduced and the mineral content by percent increased in the water. The Na in the water decreased but not significantly. John Kanzius would like government money for his salt water project so that he can work on his cure for cancer. I’ve been promised a follow up email/phone call from Kanzius so that he can provide a contact number/email that I can post. So check back.Update: Ok I talked with John Kanzius. He’s ok with being reached at johnkanzius (at) aol.com. There are three machines available. It would be helpful if someone qualified checked this thing out. “Since it appears we now have now achieved more than unity, I am going to do an embargo on releasing all further information. So why is the flame so high? Why doesn’t the wick burn? Why does the temperature so near to the flame revert back to room temperature? (See below.) The answer to all three questions seems to be that the flame shown in the video is an electrical fire. Some are calling it a plasma fire. Slide Three of this slide show has a still of the Therm Med LLC External RF System. The machine is proprietary radio frequency machine. You’ll have to check with John Kanzius about that. See above.It appears that the secret sauce in the process is in the RF frequency. The frequency itself is the catalyst. The invention relates to a method of using radio frequency waves to artificially create catalytic action in a catalyst-free chemical reaction within a substance. To mimic or imitate the catalyst, radio frequency waves are transmitted through the substance at a signal strength sufficient to electronically reproduce the effect of the physical presence of a selected catalyst. The radio frequency waves have a selected transmission frequency substantially equal to a catalyst signal frequency of the selected catalyst, defined as the signal frequency determined by nuclear magnetic resonance of the selected catalyst. It is commonplace to use nuclear magnetic resonance to identify elements within a substance and the signal frequencies of various elements (including catalysts) are listed in widely published tables. To date, the mechanism by which catalysts bring about chemical reactions has been unknown. The inventor has recognised that the physical presence of a catalyst brings about a chemical reaction due to the emission of low intensity radio frequency waves from the catalyst with the signal frequency that is emitted being the signal frequency of the catalyst that is commonly determined by nuclear magnetic resonance. Therefore, the invention can be used to eliminate the need for expensive metallic catalysts, such as platinum. The invention electronically reproduces the effect of the physical presence of a catalyst by transmission of a radio frequency wave with a signal frequency equal to that signal frequency emitted by the catalyst and as determined by nuclear magnetic resonance of the catalyst. Here is a list of his patents related to the process. European Patent Office RASBACH KLAUS (DE) This is an expired patent. I believe this gives the key. In resonance-based generation of H2 and O2 from water, using a hypersonic generator of suitable frequency, the resonance frequency (fO) can be that corresp. to the distance (d) between the nucleus of the O atoms and its outer electron shell or the proton. fO can be calculated approx. from the formula: fO = c/(pi.d), where c= the speed of sound in water and pi= the Ludolf’s no). USE/ADVANTAGE – The H2 can be used as fuel in power stations or in hydrogenation (hardening fat), synthesis of petrol, MeOH and NH3, redn in metallurgy, in welding etc. The O2 can also be used for technical and other purposes. The overall efficiency of the process is much higher than usual and the process is more friendly to the environment. “Perhaps if we could find a substance with a NMR frequency of 13.56 mhz then that is our catalyst…”. Now if you can just turn that around a bit–you might get that the frequency that the machine is imitating is that produced by platinum or 13.56 mhz. From what I understand of this, (1) day reading, is that every metal has a moleculer frequency. The patent says that these numbers are readily available. Next, you take your RF signal generator and set it to that frequency and put it into the solution according to the patent. The solution “feels” the catalyst. If it had a brain it would be tricked into thinking it is seeing that particular metal. My first thought is KOH in water and Aluminum. Replace the Aluminum with the molecular resonant frequency of the Aluminum metal and you have the KOH water mixture thinking you just put in AL. And here comes Hydrogen!! Can you say,”unbelievable!” Where has this tech been?! Here’s a google search for Kanzius+burn+water. Thus far, Kanzius’ work has not received extensive national publicity, but has been featured on several local television news programs, including WPBF-TV in West Palm Beach, Fla., WSEE-TV in Erie, Pa., and WKYC-TV in Cleveland. “We discovered that if you use a piece of paper towel as a wick, it lights every single time and you can start it and stop it at will by turning the radio waves on and off,” Kanzius told the Times-News as he watched a test tube of salt water burn. uh…. can someone fit this man’s work into their budget? I’m sure this could be worked around for water desalination/transport purposes. harvest the hydrogen before it has a chance to recombine with oxygen. You might also tune RF to settle Na & Cl ions out of solution. Just a thought.